Background and Objectives: Perioperative systemic corticosteroids are widely applied in orthognathic surgery so as to prevent postoperative complications; nevertheless the beneficial effects of this practice are questionable and concerns over its potential side effects are growing. Moreover, prescribing postoperative antibiotic regimes is considered a controversial issue. The present systematic review and meta-analysis were conducted to examine the effectiveness of antibiotics and corticosteroids in orthognathic surgery. 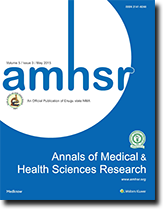 Materials and Methods: The electronically searched resources between 2010 and 2019 included a direct scientific article; PubMed, Wiley online library, Google Scholar, Upto- date, and the keywords used comprised antibiotics, corticosteroids, orthognathic surgery, orthognathic. The articles more relevant to the subjects were selected. Results: Only four of the 11 papers included in the primary evaluation satisfied the eligibility criteria and were used in the final review in studies that used antibiotics in orthognathic surgery. The remaining 7 articles were included in the final review in studies using corticosteroids in orthognathic surgery. A total of 622 patients, aged at least 30.5 years, were included in the 4 studies using antibiotics. Conclusion: The findings of the present systematic review did not reveal significant differences between the effects of five and fifteen mg of dexamethasone on facial reduction. Antibiotic regimen was also found to prevent infections in orthognathic surgery. The electronically searched resources between 2010 and 2019 included a direct scientific article, PubMed, Wiley online library, Google Scholar, Up-to-date, and the keywords used comprised antibiotics, corticosteroids, Orthognathic surgery, Orthognathic. The articles more relevant to the subjects were selected. Selected studies on the use of antibiotics and cautery are shown in Tables 1 and 2. Data extracted from studies for meta-analysis (antibiotic use) in Table 3 and (use) are shown in Table 4. Table 1: Title of selected studies. Table 2: Patient numbers and demographic profiles of included studies use antibiotics in orthognathic surgery. Table 3: Prophylactic antibiotic regimens and associated infection rates. SK Tan, et al. Group 1 Intravenous ampicillin 1 g and 500 mg every 6 h during the operation Oral amoxicillin 500 mg three times daily and intravenous placebo. Injection four times daily in the first 2 days after orthognathic surgery. Table 4: Selected corticosteroid in orthognathic surgery. 3 vials) was intravenously infused before surgery intervention No Effects of 5 and 15 mg of dexamethasone on reducing facial swelling after orthognathic surgery and on preventing PONV did not differ significantly. Only four of the 11 papers included in the primary evaluation satisfied the eligibility criteria and were used in the final review in studies that used antibiotics in orthognathic surgery. 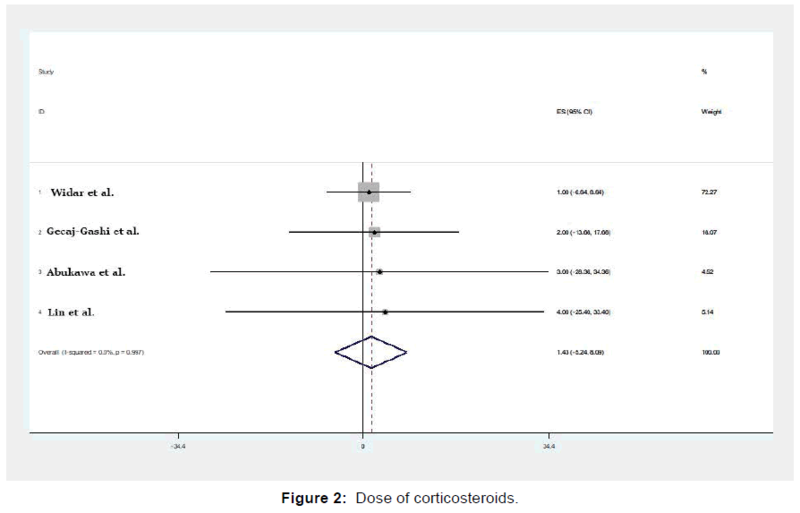 The remaining 7 articles were included in the final review in studies using corticosteroids in orthognathic surgery. A total of 622 patients, aged at least 30.5 years, were included in the 4 studies using antibiotics. The ratio of the number of females to males was 1.76. Table 2 present the demographic data of all the papers. As observed in Table 3, neither of the four studies revealed any statistically significant differences between different administered prophylactic antibiotic regimens. Figure 1 showed infection rate in orthognathic surgery and Figure 2 showed the dose of corticosteroids CM Davis et al. The number of patients required to be treated to prevent infections in orthognathic surgery was 2.23, meaning that, compared to the controls, one in every 2.23 patients receiving antibiotic prophylaxis benefits from the treatment. In terms of wound infection rates, Jürgen Zix et al. observed no significant differences between the groups, suggesting that the postoperative antibiotic prophylaxis for more than 24 h does not prevent postoperative infections. Bouchard et al. found statistically significant relationships between age and infections (odds ratio:1.04; 95% CI, 1.01-1.07, P=0.02). Figure 1: The infection rate in orthognathic surgery. The post-operative infection rates were evaluated in both the study groups for six weeks. Nine (21.4%) patients were found to have developed infections, while no adverse drug events were identified. Group 1 (3/21) and group 2 (6/21) were found not to be significantly different (p=0.45) in terms of infection rate. Age, operative procedure duration, type of surgical procedures, blood loss, surgical procedureassociated events, and blood transfusion were all found not to be associated with infections SK Tan et al. In orthognathic surgery, the prophylactic use of the first-generation cephalosporins, including cefazolin, appears more effective compared to penicillin and clindamycin in preventing SSIs. A single-day course of postoperative antibiotics is as effective in preventing infective complications in displaced orbital fractures as it is a 5-day regimen. Furthermore, Bouchard et al. observed the associated infections. In case an antibiotic is prescribed, the patient can be considered infected, and this could have been overestimated. The study by Tan et al. included only healthy adults; the findings cannot be therefore generalized to immune compromised, systemically ill or younger patients. Concomitant procedures, including septorhinoplasty, bone grafting, and distraction osteogenesis were not evaluated. Determining the effective hospitalization duration; to ensure the patients’ compliance with the medication over a 5-day postoperative period, while none of them were discharged before 5 days of the operation. CM Davis et al. determined the effects of the patients’ demographic information, including age and gender, medical comorbidities, smoking status, surgery duration, third molar extractions, bimaxillary surgery and the type of surgery on the prevalence of infection. The prevalence of SSIs was found to be correlated with none of the patients’ demographic data and third molar extractions. The findings obtained from the present systematic review suggested no significant differences between the effects of five and fifteen mg of dexamethasone on the facial reduction. Antibiotic regimens were also found to prevent infections in orthognathic surgery. Khechoyan DY. Orthognathic surgery: General considerations. Seminars in Plastic Surgery; 2013: Thieme Medical Publishers. Moore CA, Costello BJ. Peri-operative management of the orthognathic surgery patient. Perioperative assessment of the maxillofacial surgery patient: Springer; 2018;501-514. Eshghpour M, Khajavi A, Bagheri M, Banihashemi E. Value of prophylactic postoperative antibiotic therapy after bimaxillary orthognathic surgery: A clinical trial. Iranian journal of otorhinolaryngology. 2014;26:207. Brignardello-Petersen R, Carrasco-Labra A, Araya I, Yanine N, Cordova Jara L, Villanueva J. Antibiotic prophylaxis for preventing infectious complications in orthognathic surgery. The Cochrane Library. 2015. Oomens M, Verlinden C, Goey Y, Forouzanfar T. Prescribing antibiotic prophylaxis in orthognathic surgery: a systematic review. International Journal of Oral and Maxillofacial Surgery. 2014;43:725-731. Brignardello-Petersen R. Systemic corticosteroids may reduce facial edema after orthognathic surgery. The Journal of the American Dental Association. 2017;148:e185. Precious D, Hoffman C, Miller R. Steroid acne after orthognathic surgery. Oral Surgery, Oral Medicine, Oral Pathology and Oral Radiology. 1992;74:279-281. Zix J, Schaller B, Iizuka T, Lieger O. The role of postoperative prophylactic antibiotics in the treatment of facial fractures: a randomised, double-blind, placebo-controlled pilot clinical study. Part 1: orbital fractures in 62 patients. British Journal of Oral and Maxillofacial Surgery. 2013;51:332-336. Bouchard C, Lalancette M. Infections after sagittal split osteotomy: a retrospective analysis of 336 patients. Journal of Oral and Maxillofacial Surgery. 2015;73:158-161. Tan S, Lo J, Zwahlen R. Are postoperative intravenous antibiotics necessary after bimaxillary orthognathic surgery? A prospective, randomized, double-blind, placebo-controlled clinical trial. International journal of oral and maxillofacial surgery. 2011;40:1363-1368. Davis CM, Gregoire CE, Steeves TW, Demsey A. 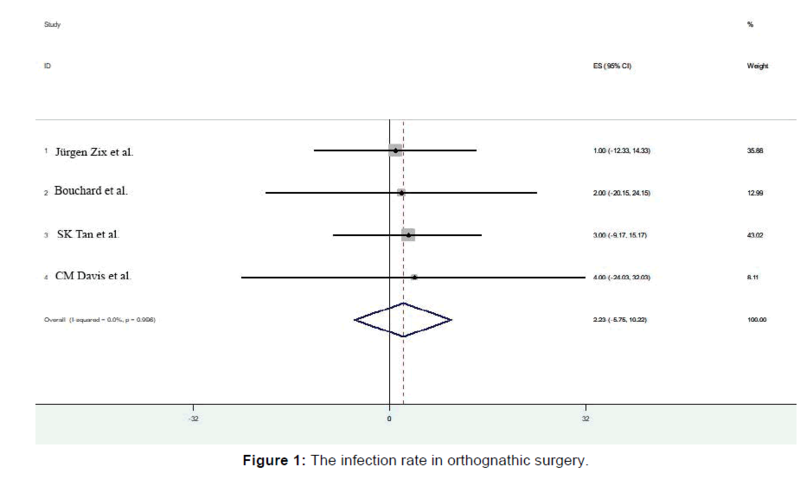 Prevalence of surgical site infections following orthognathic surgery: a retrospective cohort analysis. Journal of Oral and Maxillofacial Surgery. 2016;74:1199-1206. Widar F, Kashani H, Alsén B, Dahlin C, Rasmusson L. The effects of steroids in preventing facial oedema, pain, and neurosensory disturbances after bilateral sagittal split osteotomy: a randomized controlled trial. International Journal of Oral and Maxillofacial Surgery. 2015;44:252-258. Gecaj-Gashi A, Terziqi H, Pervorfi T, Kryeziu A. Intrathecal clonidine added to small-dose bupivacaine prolongs postoperative analgesia in patients undergoing transurethral surgery. Canadian urological association journal. 2012;6:25. Ahiskalioglu A, İnce İ, Aksoy M, Yalcin E, Ahiskalioglu EO, Kilinc A. Effects of a single-dose of pre-emptive pregabalin on postoperative pain and opioid consumption after double-jaw surgery: a randomized controlled trial. Journal of Oral and Maxillofacial Surgery. 2016;74:53e1-53e7. Lin HH, Kim SG, Kim HY, Niu LS, Lo LJ. Higher dose of dexamethasone does not further reduce facial swelling after orthognathic surgery: A randomized controlled trial using 3-dimensional photogrammetry. Annals of Plastic Surgery. 2017;78:S61-S69. Chow LK, Singh B, Chiu WK, Samman N. Prevalence of postoperative complications after orthognathic surgery: A 15-year review. Journal of Oral and Maxillofacial Surgery. 2007;65:984-992.